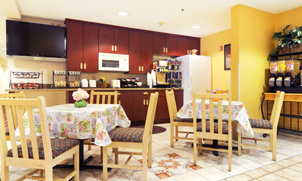 Wake up to savor the scrumptious and refreshing free breakfast at our hotel. Check the emails using free Wi-Fi access or unwind in the comfy sofa. Bake your favorite dish in the microwave or enjoy coffee munching your favorite snacks. Your stay with us is going to be a comfortable and memorable one for sure. We've assorted all the amenities to make it a perfect one. Management and Operations by Anira Hotels Inc.